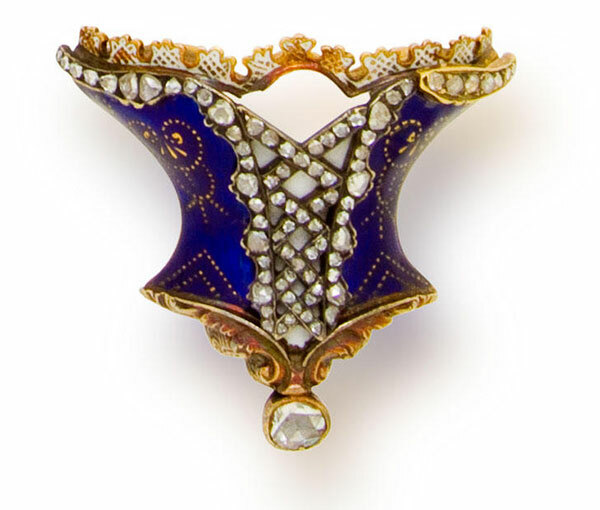 An antique enamel and diamond brooch, circa 1880, recently sold at Bonhams for $8,750. This lavish example of Victorian jewelry is designed as a blue enamel corset with rose-cut diamond ribbons and a fringe of white enamel lace. The brooch is mounted in eighteen karat gold. This small work of art is 1- 3/8in. in length.